It goes without saying that your deck should be attractive, smooth, safe, and free of splinters or other defects. While decking has traditionally been made out of wood, there are now a number of synthetic materials out on the market that resemble wood. Whether you have a large budget or a small one, there is a material out there that is perfect for your deck. 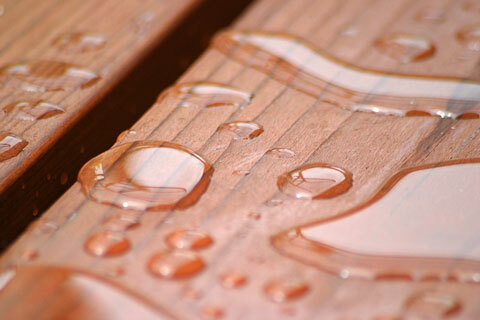 Many different types of wood are ideal for decking, including redwood, cedar, cypress, pressure treated, and Ipe. Regardless of what kind of wood you use, most wood turns a silver/gray color when exposed to the weather. For this reason, it's always a good idea to treat your deck with a clear sealer every year. Redwood is a soft wood with a reddish hue and a small, uniform grain. Naturally resistant to rot and decay, it is also a good grade of wood for painting. Cedar is another popular wood for decks. It is cream and brown in color, and has some knots. Cedar is light in weight and is also naturally resistant to rot and decay. Cypress is another rot-free and decay-free wood, typically available in the South. It is a soft wood and features a varied grain pattern. Pressure-treated wood is another good choice, as it is very strong and less expensive than other woods. Pressure-treated wood is chemically treated, which turns the wood brown or green, but the wood can easily be painted. Ipe is a tropical hardwood that is coming into style. While it is very expensive and difficult to work with, the attraction of Ipe lies in the fact that it resists insects and the elements, and has the same fire rating as concrete or steel. Ipe is dark brown in color. 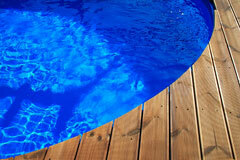 Several kinds of synthetic decking are also available. People are attracted to synthetic decking because it is maintenance-free. Synthetic decking can be plastic, vinyl, or made of composite or rubber lumber. The California Redwood Association offers basic planning, design and building tips for the deck of your dreams. The Western Red Cedar Lumber Association offers an overview of red cedar and highlights the use of cedar for decks and other outdoor structures. The Southern Pine Council features an informative chart that compares Southern Pine versus composite or plastic decking. This leading brand of durable Ipe hardwood decking is used for both residential and commercial applications. It is highly rated for strength, hardness, and durability. Features innovative decking and railing products that are made from a unique combination of reclaimed wood and plastic. Because these products are durable and low-maintenance, you may actually have more time to enjoy your deck. This Ohio firm offers a revolutionary decking material that uses cellulose materials, wood fiber, and virgin polyethylene. Their patented process provides a non-skid, splinter-free surface that does not require staining, sealing, or painting. This Minnesota plastics firm offers composite decking made from a mixture of recycled plastic and recycled sawdust. Epoch offers EverGrain composite wood decking that is uniquely created through a compression-molding process, producing a deep, lasting grain. This process creates decking and railing systems that truly look like wood, while featuring all the great benefits of composite decks and rails. This North Carolina firm features composite decking and railing systems that offer the beauty of wood with none of the work. Veranda™ composite decking and railing offers the beauty of wood without the drawbacks of corroding, splintering, termite damage, or fungal decay. Green Bay Decking offers a state-of-the-art decking and railing system that consists of matching boards, railings, posts, balusters, end caps, fascia board, post caps, post base trim, and hand rail collars. Features composite decking and railing products that are designed for long-lasting beauty, no-worries upkeep, and years of carefree enjoyment. This home products firm offers composite and vinyl decking materials that have a splinter-free surface that's safer and slip-resistant. This alternative decking product may resist stains, scuffs, and scratches better than wood or composite decking.